This fall is all about the color oxblood. I'm personally not fond of that term (gross! ), but that's what they're calling it. Etsy even did an email showing all the items available for sale in this color. What is it? 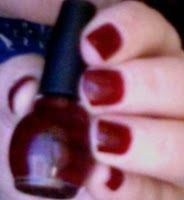 Basically, it's a deep red. This color (on certain skin tones) would look great on lips and/or nails. I currently have it on my nails & it's the color called "Sealed with a Kris" in the Nicole by OPI KardashianKolor set. Just so you know, this set was a gift, I did not pay for it. It's a jelly based polish, not a cream & it goes on super smooth. Pictured is 2 coats.